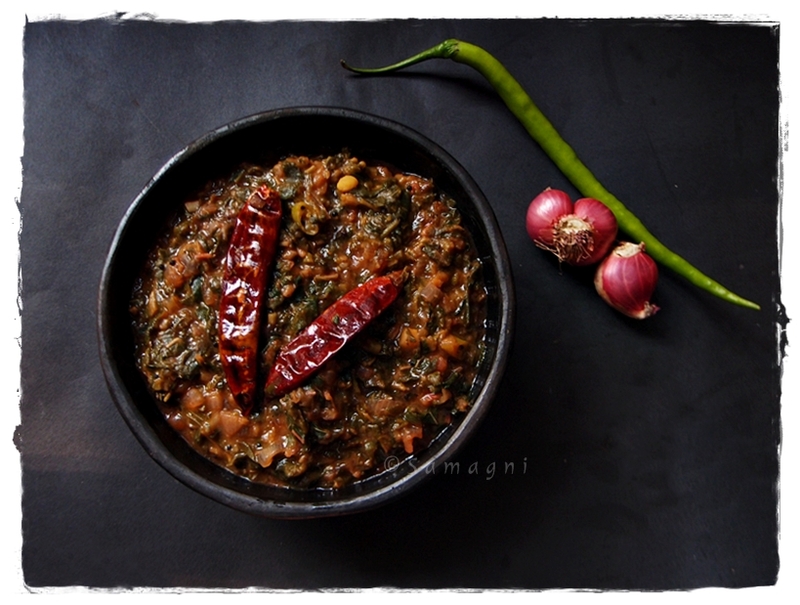 A healthy and tasty spinach/amaranth leaves and dal combo that tastes good with rice. Does not have too many spices, a simple, no-frills curry. I make this often as it is easy. It is a dish you can cook when you are not in a mood to make side dishes. This serves as a sumptuous dish and goes well with rice and chappathi. Also called molagoottal in Tamil, this is a dish Palakkad Iyers make often. Shallots is an optional ingredient. You may use any green leafy vegetable available in the Indian market to make this dish. Clean the dal, add water, and pressure cook. Mash and keep aside. In a wok, add few drops of oil and add urad dal. Roast the dal and then add the dry red chilies. Turn off the fire and keep aside. Wash, clean, and chop the spinach. In a wok, cook the spinach with water and some turmeric powder. Close with a lid while cooking. This will ensure that the nutrients are not lost while cooking. Cook in medium fire for not more than 5 mins. When the spinach is cooked, add the mashed dal into the spinach, mix well, and cook for 2 mins. In a mixer, grind the grated coconut, cumin seeds, shallots, and the roasted urad dal and red chilies. Add this ground paste to the spinach and dal in the wok. Add salt, mix well, and cook for 2 mins and turn off. Crackle mustard seeds in some oil and add that to the cooked spinach and dal. Cheera moloshyam is ready. Serve with rice. An alternative to adding the ground coconut, roasted dal, and red chilly paste is to add finely chopped onions sautéed in oil.